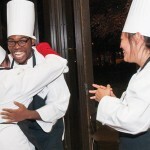 As delicious smells filled the air and time ran out, the Wayward Sons cut and plated their way to first place in the sixth annual UIC “You’re the Chef” cooking competition. 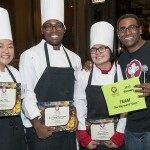 Five teams of three students each faced off at the East Café in Student Center East Oct. 16. The challenge: serve up a three-course meal in 90 short minutes. “It was hard to balance what we wanted to do versus what we could do,” said Eric Turner Washington, a senior in mechanical engineering and member of the winning team. Teams were given a tableful of ingredients provided by Dining Services to present their best appetizer, entree and dessert to a panel of five judges. Each team was assigned a Dining Services chef as a resource. 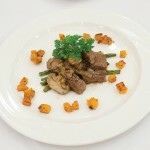 Without prior knowledge of ingredients or equipment, the student chefs had to adapt quickly. Wayward Sons, which also included Angie Moon, a senior in English, and Naomi Salcedo, a sophomore in political science — did just that. “Communicating was important — making sure everyone knew how to make certain things,” Moon said. The judges considered taste, appearance, creativity and organization. Wayward Sons’ winning menu included apple and arugula salad with fried tofu cake and apple vinaigrette, ginger garlic glazed steak with butternut squash, and apple nutmeg crepes with caramel. Look for the dishes at All-You-Care-To-Eat dining services locations Nov. 21. Judge Rim Zivalich, a two-time winner of “You’re the Chef” who appeared on Fox-TV’s “‘MasterChef” last summer, knows what it’s like to cook under pressure. “Getting to try other people’s food was exciting — I usually only get to try mine,” said Zivalich, a senior in biological sciences and retired Army National Guard sergeant with 10 years of experience, including two deployments to the Middle East.